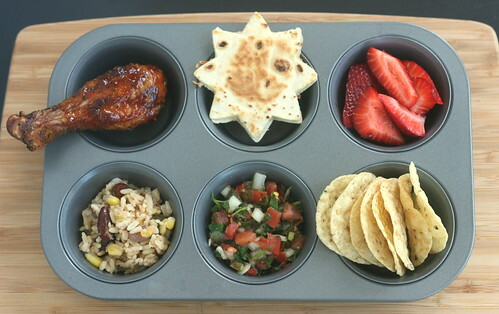 clockwise from top right: grilled chicken leg (leftover from last night's dinner), "sunny" cheese quesadilla, strawberries, corn chips, homemade salsa, fiesta rice (not sure of exact name, it's a frozen entree from the organic baby food line "Happy Baby". This one is rice, black beans, pinto beans, bell pepper. Paige and baby bug love it). You can check out what other MTM mamas are cookin' up today by clicking over here. I love the sun! What fund and yummy foods. They are so healthy. Beautiful! Hopping Blogger lets me to leave you this comment LOL but really, I wanted to tell you how amazing you are. Everything on the site, every entry looks so beautiful, and you truly have talent for this. Looks super yummy! I love the way your sun turned out! The homemade salsa looks great, and that baby food sounds amazing, too. You pulled it off well last minute! Yum! I'd love to eat that lunch! Yummy!! I love homemade salsa! The sunny quesadilla is brilliant! My kids' favorite meals are always the ones that have a 'Mexican' flavor. This would be a hit in our house. The sunny quesadilla is adorable. that sun is adorable. your photos are so bright! great job! Muffin Tin Monday - stars! Muffin Tin Monday - it's a zoo!